Since writing the below many more modules have been released using the zs-040 breakout boards. Some of the newer ones include modules with a version 3.0-20170601 firmware that work in a slightly different way. I still do not have any of these and so cannot help directly but searching for the firmware should get plenty of hits online and a good place to start is stack overflow and the Arduino forum. The zs-040 breakout boards are now being used for many different modules and you may not have the exact same boards as those shown below. The modules I am using here use the EGBT-045MS Bluetooth module and have the HC/Wavesen 2.0-20100601 firmware. They also have an EN pin rather than a KEY pin and they have a small button switch just above the EN pin. There are now newer zs-040 modules that use the real HC SMD modules, these have a newer firmware and include a blue LED at the top right of the SMD daughter board. AT command mode allows you to interrogate the Bluetooth module and to change some of the settings; things like the name, the baud rate, whether or not it operates in slave mode or master mode. When used as a master device AT commands allow you to connect to other Bluetooth slave devices. Most commands work when in any AT command mode but there are some commands that only work when pin34 is HIGH. This fooled me for quite a while. I now believe the partial/mini AT command mode is a bug in the firmware and I now only recommend using the full 38400 baud rate AT command mode. – hold the button switch closed when starting the module. Please be aware that for the full AT command mode, pin 34 has to be HIGH all the time and we cannot do this with just the button switch. When in AT command mode with pin 34 not HIGH (LOW or floating) some commands will not work and so, when using the button switch, you need to press and hold it closed when sending some commands. – 2. Hold the small button switch closed while powering on the module. – 3. Press and hold the button switch. – 4. While still holding the button switch closed, apply power. – 5. When you see the LED come on you can release the button switch. Enters AT mode with the built in AT mode baud rate of 38400. The baud rate cannot be changed by the user. This method allows the module to enter AT mode on start but but does not keep pin 34 HIGH and some commands will not work. 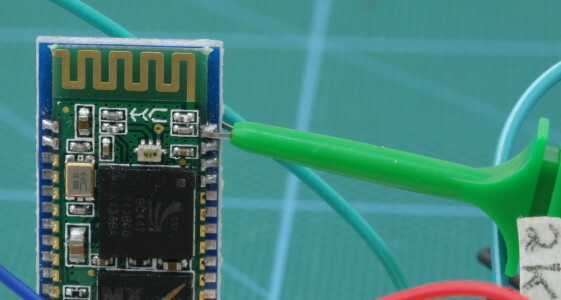 Alternatively, if you are using AT command mode for any length of time, make a direct connection between pin 34 and +3.3v. Either solder a wire to the pin or use a clip. Using pin 34 to enter full AT command mode using 38400 baud rate. If you keep pin 34 HIGH you will enable the “full” AT mode which allows all AT commands to be used. If you let pin 34 return LOW after power on then “mini” AT mode will be enabled. 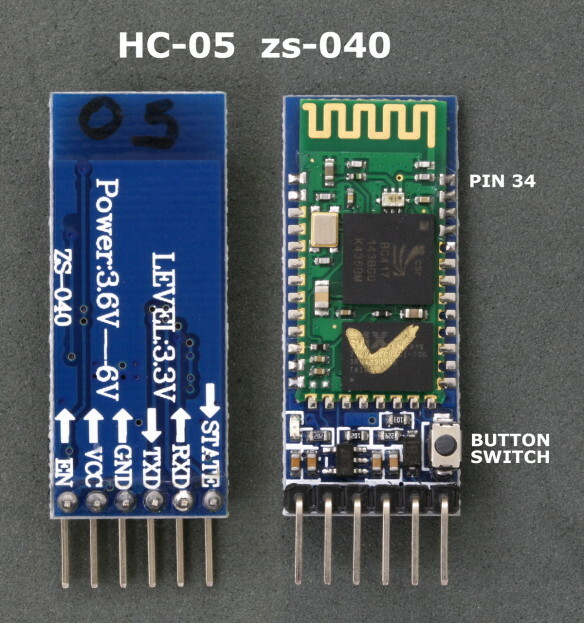 There are a couple of common ways to connect the HC-05 to a computer; via a serial UART adapter or with an Arduino. Here I am using an Arduino. Build the following circuit and upload the below sketch. – Optional. Connection from pin 34 but do not apply 3.3v yet. The sketch is a basic serial in – serial out that displays a “>” at the start of a line to high light the user entered command. I use software serial on Arduino pins 2 and 3 to talk to the HC-05. This means I can still use the hardware serial to talk to the serial monitor on a host computer. //  Intended for Bluetooth devices that require line end characters "\r\n"
//  the Arduino will relay it to the bluetooth module and display the result. Connect the Arduino to the host computer. The LED on the HC-05 should be blinking quickly at about 5 times a second. If using the connection on pin 34, remove power, connect pin 34 to +3.3v and re-apply power to the module. If using the button switch, remove power, press and hold the button switch, re-apply power (while holding the button switch). When you see the LED come release the button switch. The LED should be blinking slowly on/off once every couple of seconds. This indicates AT mode. The HC-05 expects commands to include a carriage return and newline characters (\r\n). You can add these automatically in the serial monitor by selecting “Both NL & CR” at the bottom of the window. You can also enter them manually in the form AT\r\n. If you forget to add carriage return and newline characters the HC-05 will not respond. AT+VERSION – returns the firmware version. Windows does not support baud rates above 115200. If you accidentally set the baud rate higher than 115200 you will not be able to use communication mode. You should still be able to enter AT mode at 38400 using method 1 or method 2 above and change the communication mode baud rate to something Windows can handle. Querying the modules name with AT+NAME? only works in “full” At mode. If you cannot get AT+NAME? to work you need to bring pin34 HIGH. Changing the modules name with AT+NAME=newname works in “full” AT mode and “mini” AT mode. Other commands that require pin 34 to be HIGH are AT+INQ and AT+RNAME. This is not a complete list through. 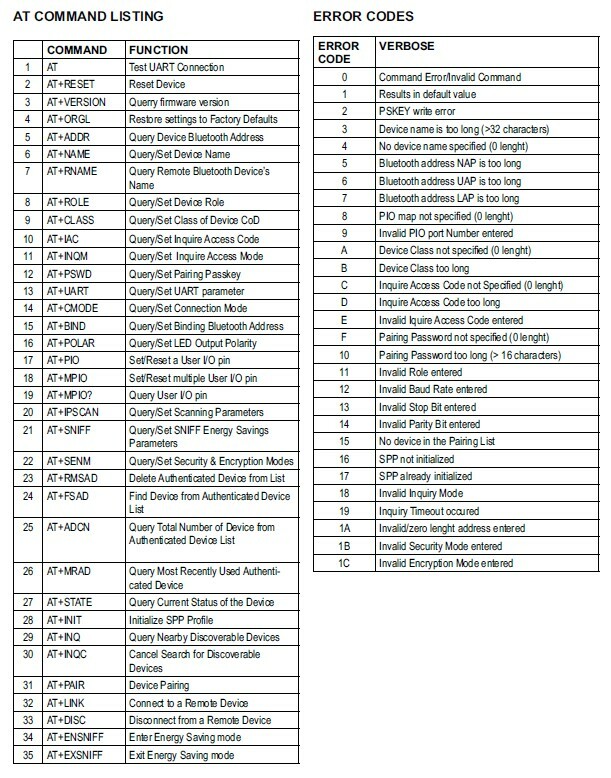 This list is taken from the EGBT-045MS bluetooth module user guide and not all commands may be supported or work straight away. For example AT+NAME? only works when pin 34 is HIGH. This entry was posted in Arduino, Bluetooth and tagged arduino, AT mode, Bluetooth, HC-05 by Martyn. Bookmark the permalink. Thank you so much , you’re article is the only that answered my question about how to get the zs40 into AT mode. +1 I agree with montassar. I was not able to get all the AT commands until I read this posting. The at+name? was making me nuts. Now, I hold the button and the command works. I never leave a comment, but this article is amazing. I bought bluetooth module to communicate with my electric skateboard 4months ago but nothing work so I leave the bluetooth module. And now thanks to this article it works fine ! I’m so happy ! Hi there, I have tried both ways and it did not work what you think could be the problem? I did all in your description, but there is no echo from the HC05 (zs-040). the HC05 is still blinking with 1 Hz. If you connected EN to +5 V, you may have fried your HC-05 module. When connecting signal inputs (including Rx and EN) to a 5 V Arduino output, the connections MUST to go through a voltage divider circuit (as Martyn has shown in his diagrams) or you risk damaging something. Also, be aware that some versions of the carrier board (ZS-040) may not have the EN pin connected to the HC-05 module pin 34. Remember to to set Both NL & CR in the serial monitor. This is what happens when you have the wrong baud rate set for BTserial. Try using 9600 baud rate of different baud rates.. It sounds like you have the wrong baud rate. The modules I have use different speeds; AT mode is 38400, and communication mode is 9600. Remember there are 2 different serial communications. The baud rate shown in the serial monitor is for the communication between Arduino and computer. this is the last scetch i’m using. i also tried change the baud ratio in the BTserial, i tried whith 1200, 2400, 4800, 9600 etc, but i only have “response” using 38400. I even used the AltsoftSerial library and diden’t work. I check in the net and some other few people has the same problem but no one seems find a solution. I can’t duplicate the problem. I do get some garbage when I use an incorrect baud rate but it is intermittent. As soon as I use 38400 everything works fine. Try different pins, for example use Pin 2 and 3 and reseat all the connections. try to remove the arduino IDE and reinstall it again, then go the same steps you made . try to remove the arduino IDE and reinstall it again. hey, did you find the solution to the problem? I got the exact same result as yours on my serial monitor. Thanks in advance! The closest I have been to recreating the problem is through using the wrong baud rate. Try the different baud rates and note the responses you get. One of then should work but it may not be 38400. I was having the same problem, weird characters from the BT Module. It happend to me before, some libraries won’t work fine with the latest version of the Arduino IDE, I was using v 1.6. I tried the very same sketch with the Arduino IDE v 1.0 and it all went perfect. Try to download it from the arduino site. Thanks for posting this. I had not considered the IDE. I tend to take a while to upgrade so I am still using older version. Had the same issue using Arduino IDE v2.1, now everything is great with Arduino IDE v1.6. Hi, I got two problems with this HC-05 module. 1. When I type AT+NAME? I got no response. I do not understand why is that so, I got all responses for AT+ROLE? AT+PSWD? but not AT+NAME? Can answer this ? 2. I can’t search this HC-05 Bluetooth module with my ios devices. I can find it with other android devices but not my iphone or ipad. How to solve ? AT+NAME? only works when pin34 is HIGH. If using the button switch, close the switch just before sending the command. The HC-05 and HC-06 do not work with idevices. Apple products do not support the Bluetooth protocol that the HC-05 /06 units use. If you want to connect to an idevice you will need a BT module that uses BLE / Bluetooth 4.0.
how to configure master mod? how to pair android? What do you mean master mode? If you mean AT mode then see above. AT+INIT and AT+INQ not responding. You need to make pin 34 HIGH. we are using ARDUINO MEGA and we also encountered the same problem after entering “AT” then “1”, the serial monitor respond is “BT STATE”. we tried “38400” and “9600” but didnt get any response. but when we used ARDUINO UNO. we got an “OKAY” respond from the serial monitor. The mega has additional hardware serial channels (I think it has 4 in total). Instead of using software serial use one of the other hardware channels. The additional hardware serials are on pins 14 to 19. See https://www.arduino.cc/en/Tutorial/MultiSerialMega on setting it up. is it similar when configuring ZS 040 using arduino NANO? I have just added a intro guide for the Arduino Mega. Hope this helps. But the data appearing on the serial monitor of uno is not going on due . Confirm that they are actually talking to each other. You can do this with 2 serial monitors. You can also set one to send test data; for example “1234” every second. hi, how did you paired the two HC 05 bluetooth modules? my serial monitor always respond “FAIL” during the “AT+LINK” command. Did you configure a HC-05 using a Arduino due? I am trying to do it but having nothing in response from the module. I haven’t used a Due but it should work with the HC-05 albeit with some changes. The Due has 4 hardware serials so you should use one of these for talking to the HC-05 rather than software serial. Since the Due is a 3.3v device you do not need the voltage divider on the HC-05 RX pin. Connect the Due TX pin directly to the Due RX pin. The HC-05 needs at least 3.6v on the vcc pin to work correctly. I believe the Due has a 5V out pin, use this rather than the 3.3v out pin. Have a look at http://www.martyncurrey.com/using-an-arduino-mega-with-a-hc-05-zs-040-at-mode/. This is for the mega but uses hardware serial1 and the same as using serial1 on the Due. i have tried the way you mentioned it didn’t work but when I connected the RX pin to RX pin of the board and the TX pin to TX pin then it worked. RNAME only works for me when pin 34 on the HC-05 is HIGH. When pin 34 is LOW or not connected I get nothing, no reply and no error message. Are you able to use AT+INQ and AT+RNAME with pin 34 LOW or not connected? On the modules I have I have to set pin 34 HIGH before the commands give a reply. the serial monitor responds properly AT+INQ and AT+RNAME, pin 34 is HIGH. we only get “FAIL” respond evertytime we use AT+LINK. You need to keep pin 34 HIGH. Certain commands like AT+INQ etc need pin 34 to be HIGH. If pin 34 is LOW or not connected then the module does not respond (no reply and no error message). I am going to solder a wire to pin 34 to make switching HIGH/LOW a bit easier to do. A wire connected to the top of the button switch should also work. I have updated the guide and the new information may be helpful to you. Your tutorial was the only one using which I could successfully access the full AT functionality. But even after powering the PIN34, as soon as I enter the command : AT+INQ, the LED starts blinking fast and there is no other response. As per your advice, I pressed the switch while doing this, but again the same happened…but this time, it prints “OK” instead of printing the addresses. I am using the same version as yours. Pin34 on the HC-05 needs to be HIGH for all commands to work. This will bring up a list of found devices. One of them should be the HC-06. If the HC-05 cannot pair with the HC-06 within 9 seconds you will get an error message. Once set, on start up the HC-05 should automatically connect to the HC-06. once i turn OFF the the MASTER module, and then i turn it on again, the MASTER module WOULD NOT CONNECT automatically to the SLAVE module. HOW CAN I AUTOMATICALLY THE MASTER TO THE SLAVE MODULE? I have just added a video to the http://www.martyncurrey.com/connecting-2-arduinos-by-bluetooth-using-a-hc-05-and-a-hc-06-pair-bind-and-link/ post. The video shows the HC-05 automatically connecting to the HC-06. Have tried this many times now and I seldom have a problem. They do appear to connect more quickly if the HC-06 is turned on first. Hello, do you happen to know any way in which an hc-05 would suddenly malfunction (as in not respond to AT commands and serial communication problems)? Or have you heard of any such cases? I’ve already gone through several hc-05’s. I have absolutely no idea why this happens as there isn’t any commonality between the malfunctioning (it doesn’t happen as a direct result of something – one moment, it works and when I try again later on it just suddenly doesn’t). I haven’t come across this. My modules have been fairly robust – dropped on the floor, connected the wrong way, etc. If the LED is working normally then you know the module is still alive? Are you using a voltage divider on the RX pin? You can damage the mini Bluetooth module by connecting 5V directly to it. Turns out I was sending 5v signals to BT Rx pin despite connecting 3.3v to the vcc. I guess that was slowly damaging the modules. Hopefully no more of them will die. do you have an idea on how to do this? and how to determine if your bluetooth module supports the “multi instance SPP” ? sorry, I have never done this. It does sound interesting and if possible may be an easy way to create a small network. Not sure when I will get time to investigate though. Thanks for sharing fine information. I have the HC-05 zs-040 with the button on breakout board over EN Pin. I am unable to connect to the AT mode, only the third method worked but the settings are reduced. I have a GW-040 model, used this tutorial to be identical. Does anyone know any specific tutorial for this model (GW-040) or that works. I’m not familiar with the GW-040 boards and I can’t find anything online. Can you post a link to the ones you purchased. It does appear that the same breakout board is now being used for different bluetooth modules. I have some new boards marked as FC-114. These use the same breakout board but run a different firmware and act very differently to the zs-040s. Is it a HC-05 and does it have 6 pins? Does the breakout board look to be the same as the zs-040? Have you tried bringing pin 34 HIGH? What firmware is the module using? The FC-114 boards I have have the Bolutek firmware which starts in AT mode. See http://www.martyncurrey.com/hc-05-fc-114-and-hc-06-fc-114-first-look/ and http://www.martyncurrey.com/hc-05-fc-114-and-hc-06-fc-114-part-2-basic-at-commands/. I also have a GW-040 board. No response to AT command. Tried the 3rd method because it involved the least work. Have tried the other methods. I guess I should be grateful the module works. I had the RX and TX wires reversed. THANK YOU SOOOO MUCH!!!! I was trying to get my HC-05 into AT-Mode for 2 days and your tutorial was the only one which worked :-D! You didn’t say but I am assuming you have the HC-05. I’m not 100% certain but I believe you have to initiate the connection from the phone. Are you able to establish a connection from the phone to the BT module when using the phone to initiate the connection? If you have the HC-05, does the phone appear when you scan for bluetooth devices using the HC-05? My main interest is this command AT+LINK. Under what conditions does it work? It always shows FAIL every time i try. After you have paired the devices you need to use a third party software to actually make a connection. Have a look at http://www.martyncurrey.com/arduino-with-hc-05-bluetooth-module-in-slave-mode/. Here I use and android app called Bluetooth Terminal. It is the app that makes the connection but it can only connect to paired devices. I have never tried using the HC-05 to make a connection to an android device, I have always used the Android device to initiate the connection, when I get time I will try some experiments. I’m very busy at work at the moment so not sure when this will be. Linking has to be done in a certain order; BIND, CMODE, LINK. See http://www.martyncurrey.com/connecting-2-arduinos-by-bluetooth-using-a-hc-05-and-a-hc-06-pair-bind-and-link/ for details. Hi Martyn, first of all i wanna tell you it’s great to have all this information about hc 05. Thanks for sharing the information needed. I have a problem and hope you can help me, when sending an AT command, I can only send one at a time, and after that, no value is return, I have to disconnect the VCC from BT and reconnect it to send another AT command, what you think can be the solution ?. Can you explain what you mean by one at a time. Do you mean the first command works but the second,third etc does not? Are you sure you are in AT mode? Does “AT” work, do you get the “OK” reply? What model HC-05 do you have? Do you have the zs-050? Do you have the correct line endings set? Can you make contact with another device, for example an Android device? Exactly, first command works but the second,third etc doesnt. im sure that AT mode is on cause led blinks each 2 seconds (aprox), and when send an AT command i ge an OK, but only the firts time. I got a zs-040, and i already tried some AT comands. Also i tried to connect with my android, and it works. Do you have “Both NL & CR” set in the serial monitor? using sketch “Basic Bluetooth sketch HC-05_02_9600+ECHO” what do you get in the serial monitor? When sending an “AT” command, I got “OK” reply only at first time, and after that, no value is return when I tried same thing 2nd,3rd time etc. I have connected BT HC05 module to computer with USB to TTL converter (CP2102). Connection is correct and I have tested each and every baud rate as well. While if I connect this BT module with my android then data communication is working fine. The thing is only I can’t able to get response to any command while AT command mode is enabled again(Conclude because led blinks each 2 seconds (aprox)). what you think can be the solution ?. Confirm what module you have. There are several that look the same but use different firmware. Once you know look for the data sheet. If you get an OK then you have the correct baud rate and need to try different command formats. Try different line end characters. I Used the sketch “Basic Bluetooth sketch HC-05_02_9600+ECHO” and works great! Thanks Martyn, you are Awesome! Great article. It works great. But setting pin 34 high while you have the ground disconnected (BT_POWERPIN is still low) will do nothing as without ground the high on pin 34 has no place to go. Forgot to add, if this works it’s by pure luck. I’ve tested the above circuit and it appears to work fine. It may be that there is protection on the BT module. However, you are correct that there may be an issue and I have updated the guide. The example now uses a PNP transistor on the high side. Yes there are NL and CR characters after the visible characters. If you are displaying the received data on an LCD you will need to remove them. The NL character is the last character so if c==10 you are at the end of the line. It sounds like you have the wrong baud rate or the connections are not correct. 1. Double check the connections. 2. Using the Basic Bluetooth sketch HC-05_AT_MODE_01 sketch, run the sketch, open serial monitor and cycle the power of the HC-05. If you do not get a start up message, try a different baud rate. Start at 9600 and keep going until you find one that works. I can get the HC_05 led to blink slowly but it will not give any feedback to my AT commands. have tried 9600 and 38400 as AT baudrate but no luck. Have you selected “Both NL & CR” in the serial monitor? Check the connections. You can follow the second example on the http://www.martyncurrey.com/arduino-with-hc-05-bluetooth-module-in-slave-mode/ page. If 9600 does not work try other baud rates. Using the same sketch, open serial monitor and then cycle the power to the BT module. If you have the correct baud rate you should get a start up message. If you do not get a message, change the baud rate, recompile etc and try again. It is worth confirming you are in AT mode. Start the BT module in normal mode and use an Android device to scan for BT devices. Your HC-05 should be listed. Now put the HC-05 in to AT mode and rescan. The HC-05 should now disappear. If it still shows then it is not in AT mode. Lastly, try to confirm what module you have. Newer ebay modules are using the same breakout board but use a a different firmware. See the FC-114 posts. If you are still having trouble post a photo of your module and let me know what name is reported when you scan for BT devices. I had written a long reply with lots of data and details when I discovered that a 10M resistor had slipped into my stack of 1M’s and was playing a trick on my voltage divider. Ha ha. Sounds like something I would do which is why I like to put little stickers on the resistors I use for bread boarding. Hello,May I know how to wire the two pins marked in HC-05,STATE and EN.Could you please specify how two wire these two pins generally? I shorted pin 34 with EN pin. But now I cannot see my LED on BT module blinking 5 times a second by providing digital LOW to EN pin. Anyhow, if I provide digital HIGH to EN pin it blinks on/of f every second. What am I doing wrong here? How can I control configuring BT module either in Command mode or in Data mode as per my wish through my Arduino Code. Kindly help! As suggested by you here, http://www.martyncurrey.com/connecting-2-arduinos-by-bluetooth-using-a-hc-05-and-a-hc-06-easy-method-using-cmode/#comment-4644 I tried using method two. Now here I once I enter AT mode, how do I come back to data mode? Start the BT module first, then bring pin 34 HIGH. This puts you in AT mode using the user defined baud rate. To exit AT mode bring pin 34 LOW. I think Example 4 is what you need. This allows the Arduino to control entering and exiting AT mode. I have pin 34 high (3.3v) and still AT+INIT, AT+INQ, AT+PAIR etc do not work, hence not getting no response what so ever when I enter the AT commands. Solved, just in case someone has the same problem, I was using realterm. Use the send tab instead of writing on the blackscreen, write each command in capslock and at the end insert \r\n. Thank you for posting your solution. I have 2 arduino uno boards, each connected with HC05(with button and EN pin-ZS040). Of these I want to use my 1 HC05 module as master for some time say for a period of 1 minute and then as a slave for same period of time (1 minute); at this time I want to keep my other HC05 module as slave for first one minute and then as master for other minute. Within this span I want these 2 modules to connect with each other, exchange information and raise a flag when exchange is over; And then again configure one as master and other as slave and repeat the process. But I am totally confused about how should I do this using just arduino code without any human intervention. Could you kindly help and guide me here? Unfortunately I don’t have the time to create the code but this would be a really good way to learn Ardiono and Bluetooth. 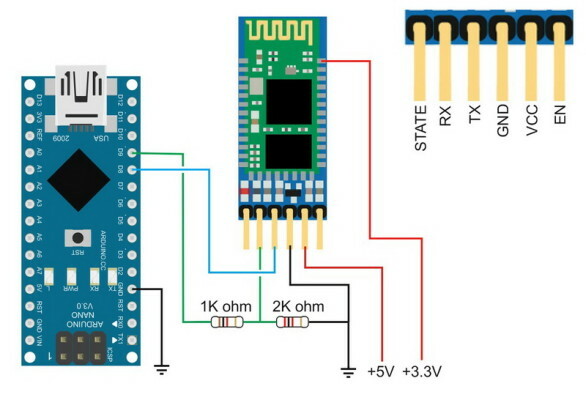 If you are not sure about controlling the HC-05s start with a manual process, get the 2 Arduinos communicating manually (you enter the commands via the serial monitor) and after you have worked out what commands to use and when you can create a sketch and let the Arduino do it. Start with example 4 above. Change the code so that the Arduino controls when the BT module uses Master mode and when it uses Slave mode. I would suggest adding an LED to the Arduino to show the mode the HC-05 is using. When doing the code use millis() rather than delay. You can find more information by search for “blink without delay” on the Arduino forums. After you have got the first Arduino working start on the second. I am able to control working of HC05 using Serial Monitor and exchange data between 2 BT modules with human intervention. But I am not able to do it automatically without any human intervention. I would write the code by myself if you could kindly guide me about how to control BT module without use of Serial Monitor i.e. without any human intervention. If you could kindly guide me atleast how to setup a connection between 2 BT modules then get some acknowledgement from BT to arduino to start communication and then again get acknowledgment when communication is over… Something like that? have a look at http://www.martyncurrey.com/connecting-2-arduinos-by-bluetooth-using-a-hc-05-and-a-hc-06-easy-method-using-cmode/ and http://www.martyncurrey.com/connecting-2-arduinos-by-bluetooth-using-a-hc-05-and-a-hc-06-pair-bind-and-link/. 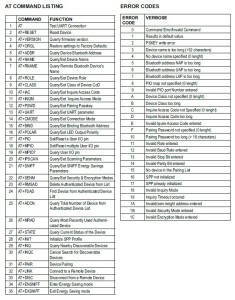 These guide you through connecting Arduinos using HC-05 and HC06. You can do this manually and it only needs doing one time. Once the devices have been linked it should be fairly easy to control from an Arduino. Thanks for all your guidance and help!! :) Thanks a lot!!. I achieved entering command mode/ data mode through my arduino code after required amount of time in a loop. But now I am facing problem in either configuring it as master/slave when in command mode. I tried BTserial.write(“AT”)/BTserial.print(“AT”)/BTserial.println(“AT”), but none of these gave me a reply of OK. Where am I wrong here? Kindly guide and help one last time. I tried to follow your excellent guidelines to make a connection with a PC instead of an Arduino but I have not been able to make it work. Will you be so kind to include some guidelines on how to do it with a PC? It is my understanding that the PC has to be the master device and has to initiate the connection. This means the HC-05 should be in slave mode. Turn on the HC-05 and then use the PC to search for Bluetooth devices. Btserial.print(“AT\n\r”) works but it giver ERROR:(0) instead of OK. Any suggestions? Has it got something to do with 8 data bits and 1 stop bit? I used BTserial.print(“AT\r\n”) and now I am getting OK reply. Thanks for all your help and guidance! Is it possible to flush off the data stored in HC05’s receiving buffer. BTserial.flush() is not working? The only way I know in AT mode is to issue a LF and CR. This results in an error but once you have the error you can send new commands again. In data mode I don’t think you can flush the modules buffer. thanks for a great tute. I’m using HC 05 and HC 06 on two nano clones wired as per your tute. I followed it exactly and got the two BT units communicating however the two serial monitors only display (x,€ ϴ) when sent alpha-numeric chars from the other monitor. Also the SM on master displays the sent characters as typed. It looks like a baud rate issue but the baud rates are all set to 38400. Which of the above methods are you using? It looks that you have a incorrect baud rate. Remember that communication mode uses (or can use) a different baud rate to AT mode. Do you have pin34 HIGH? Pressing the small button switch makes pin34 HIGH so just before sending the commands press and hold the button switch. Wait for the reply and then you can release. I have read many of your post about hc-05 module. I also experimenting with HC-05 FC-114 and eventually enter into AT mode following instruction here (after so many failed attempt) so thanks. But I wonder how many type of break-out board and firmware available out there? so far I assume you have encounter three type of breakout board (FC-114, ZS-040, FS-040 ) and bolutek firmware. But my FC-114 have firmware version: 2.0-20100601 which i’m not sure whose firmware is that (linvor, bolutek, or another). Sorry, I don’t know of a list. I have a question, hope you help me. I want to tranfer files between two Arduino UNO’s using hc-05 bluetooth module. I have been searching for a couple of hours and seems nobody had similar project with me. Is it possible sending an audio file (.WAV in my case) from an Arduino to another Arduino using hc-05 module? This is possible but the scope of this guide. Not sure if there is a file transfer library but it should not be too difficult to write your own basic code. If not already a member, join the Arduino forum at http://forum.arduino.cc/index.php and ask there. Excelent article, thanks a lot for sharing this. I can use and test each and everyone of the AT commands succesfully (Method 2). I can also pair my HC-04 ZS-40 to my Android smart phone but I just don’t know how to stablish a connection between them. I’ll appreciate any hints to acomplish such connection. I’ve googled for a long time.. Can’t find out how to exit command mode. anyone? I see you using AT+RESET. Is that the only way? Wondering because if I tie the KEY pin HIGH i’m going to be stuck in command mode every time the module reboots. If you want this to be fully controlled by the Arduino then you need to put a switch on the connection to the KEY pin. The switch can be a transistor that is controlled by the Arduino. See example 2 above for an idea how this works. I followed your instructions and changed the name if my module. Then turned off my module and powered it on again. I also Tried AT+RESET it resets my name password an all. The HC-05 enters command mode when pin34 is HIGH. Remove power from pin 34 and restart the module. No use, Still having the same problem. My module has a button on top of EN(key) pin. I have to press in while making the 34pin high. It worked perfectly in command mode. It still does work in Command mode, but when i pair my module it does not show data transfer mode the led bliks like it does in Command mode when paired. Without doing anything else, open the serial monitor and send AT, do you get the OK reply? Thanks for your effort is back to operation. The problem was with my phone! SERVO_1.write (180); // Στρίψε Αριστερά. SERVO_1.write (0); // Στρίψε Αριστερά. probably the best method is to use the STATE pin on the HC-05. When the HC-05 is connected the STATE pin goes HIGH. Connect this to the Arduino and then in your sketch keep checking the pin state. HIGH means connected, LOW means not connected. case label “S” is not within a switch statement. The check on the BTstate should not use the case statement. In this way you are only reading and processing commands when connected. i tried it but it doesn’t move.Can you help me please? check the state of the STATE pin. Make sure it is HIGH when connected. Hi. is possible operate (AT commands) with the module throught the Arduino Nano in FTDI mode (RST+GND bridged)? not sure what you mean. Can you explain further? Is this firmware related? And do you know where I can get the firmware your BT module uses? I don’t have any modules running this firmware so not sure how much I can help. From a brief internet search it looks like these are HC-06s and use version 2.0 of the Loinvor 1.8 firmware (I have not been able to confirm this) and pin 34 in not used (they don’t have an AT mode). how can i understand the buad rate in the forth way of getting into the AT mode? After applying power, bring pin 34 HIGH and keep it HIGH. This will enter AT mode using the baud rate you set for communication. If you have not changed the baud rate it will use the default speed which is usually 9600.
thanks i have two of them connected to each other but i can’t send or receive data using them do you know what i should do ? can you help me with my project? If you are using the Arduino IDE then using the ATmega16 will be the same as using an Arduino. sorry can i have your email so i can ask my questions there ? I’ve bought 20 pcs HC-05 / ZS-040 again. The new ones differ from the old ones in that the „STATE” pins don’t show whether the devices are connected or not, but these pin are floating. Could you recommend some solution? Perhaps there are commands to set these features. Using sw work-around like “AT STATE?” command would mean some problems. Check which firmware you have and then see if one of the pins on the actual Bluetooth module (the small daughter board) is being used. It may be that the pin used is not connected. If this is the case you can connect a wire directly to the pin. The third pin from right was not soldered. Perhaps it is usefull for others. double check the connections, the resistor values and the baud rate. Almost every time somebody reports an issue it is because they have a wrong baud rate, incorrect connection or the resistor are incorrect. After rechecking the connections and resistor confirm you are actual entering AT mode by checking the LED blink rate. Since you are using the mega, you should one of the extra hardware serials rather than software serial. Thank you for all the details, finally a good recap, thanks a lot! I am a complete newb to Arduino programming/components I have been looking all over trying to find someone that has connected one of these to an HC-05: http://www.ebay.com/itm/261825615469 all I want to be able to do is control one single servo using the mini gamepad. Do you know if this is even possible? it looks like they are Bluetooth V3 which means they will not work with the basic HC-05s. The HC-05s are Bluetooth V2 only. They may work with Bluetooth V4/BLE but I cannot say for sure. Well thats a bummer. Thanks Martin for your quick response. In method 4, in communication mode HC-04 led is not blinking and in at mode led is blinking @ 2 sec interval, However, I can’t get response from HC-04 in serial monitor for at commands. I have checked my connections and resistors value. Do you mean HC-05? If so, you may have a newer board. I now have boards that are very similar to the above but have a different firmware and require that pin 34 is pulled HIGH before power is connected. yes HC-05. Previously, I had soldered the key pin to en and then connecting en to D4. Now i have soldered it directly to pin 34 and it is working now. However, LED on HC-05 is blinking at 5 times/sec interval even in AT mode. I have confirm AT mode in serial monitor by running AT commands. Thanks for the great information and links here. Most useful in getting my HC-05 set up and running. I’m trying to set things up but I’m conncting hc-05 to my PC using RS232 USB TTL cable. No arduino. I’m able to get the led to blink slowly by holding the key down while powering up, which means its in AT mode. Set arduino serial to NL+CR, 38400 baud rate. Getting no response on AT commands.Just accepts the command but no output. What am I doing wrong? Without a lot more information I cannot say but almost all issues like this are due to incorrect connections or incorrect baud rate or not setting NL+CR correctly. I am a Beginner Bluetooth Module User! The Description says HC05/HC06 Compatible??? with AT+UART=300,0,0 to 300 Baud. It only returns “00000000” or “nul” or nothing at all? i get confusing unknow Characters like C0 FE or so? If you really have set the baud rate to 300 bps you can either reset the module back to factory settings with AT+ORGL or use a terminal app (such as putty) that can use 300 bps. It looks like this module has a slightly different firmware to most common HC05s, therefore, if not already, get the correct data sheet. Two resistors connected in this way form a voltage divider. The BT RX pin is 3.3V and the Arduino TX pin is 5V so we need to convert the 5v to 3.3v. Using a voltage divider is an easy way to do this. As a quick guide to the voltage divider; 1K + 2K = 3K. 1K is a third of 3K so it reduces the voltage by a third. One third of 5V is 1.66 and 5-1.66 = 3.33 which is what we want. Putting the resistors the other way would reduce the voltage by 2 thirds. Oh umm okay. So we need a 2K resistor between RX and GND. Okay that makes a Y shape. I got it. We connect these to RX and TX of arduino. Why we connect them to D2 and D3? We have TX and RX ! And also why we dont use arduino’s 3.3v out pin? When using Software Serial we can define what pins we use. In the above example they just happen to be D2 and D3 but you can change these to suit what ever project you are doing. So my pins is to nir.ally RX TX? True logic? You cannot simply use RX and TX unless you define them as variables and give them a value. While getting things to work, keep it simple, use the actual pin numbers. I tested the module on this PCB and the communication mode works fine, however, I’m attempting to access the AT mode using method 4 but I’m not getting any results. Can you please advise on what I’m doing wrong here? Do you have the same module? There are now newer units that have an LED at the top left. These have a slightly different firmware and cannot be switched in to AT mode the same. I tried using two different modules, one which does have an LED and one that doesn’t. I believe the one with the LED did indicate that the module is in the AT mode (by flashing slowly) but I don’t get a response when i send out “AT” (with /n and /r). Note the module in the above link is the HC-06 but the line endings are the same. I see. Do you have any idea why I’m unable to get into AT mode using the HC-05 (non LED) modules though? I don’t believe there are any issues with the connection since triggering the AT pin high does in fact trigger pin 34 on the module, but the module is not in AT mode. try bringing pin34 high before powering the module. i have hc-05 (ZS-040) , i can access AT commands when the bluetooth is not paired by device (in my case is android) , my question is why the AT commands is working when the bluetooth is not connected / paired with my android smartphone but doesn’t working when the bluetooth is connected / paired to my android smartphone ? When a connection is made the modules treat all received data as data and send it to the connected device. so are you saying it can’t send AT commands over bluetooth ? None of the classic Bluetooth modules I have can send AT commands over the connection.There may be some available but I am not familiar with them. One that I know that allows it is the HM-10 but that is BLE not classic Bluetooth. I am trying to switch on an led with HC05 and arduino.So when i code the arduino with 1 as on and 0 as off,it works with my phone but if i type 2 also it switches on.Can you find the problem? BUT if I type AT and click Send I dont get any responce. Please help me! The HC-05 requires baud rate 38400 for AT mode. Hi, how could I take my HC-05 module out of AT Command Mode without disconnecting the Arduino? I have a system which automatically puts the module into AT Com mode, but then in order for devices to be able to connect it needs to be taken out of AT Command mode and into its normal state… I’ve tried resetting the baud rate and nothing happened. Anyone know how I could take the module out of AT Command Mode and into it’s normal state without disconnecting the arduino? Make sure pin 34 is not HIGH and then use the reset command or cycle the power. If pin 34 is HIGH when you reset you will go back to AT mode. after hours of frustrating tests with no results I figured out that I have to write the AT-commands in capital letters (AT..) instead of (at…) and then I got a response. Hiii……Why are you not using the default Rx and Tx pins of Arduino for serial communication??? For examples and testing I like to use the serial monitor. This means I cannot use the hardware RX and TX pins. If you have a project that does not need to use the serial monitor then the hardware RX and TX pins are the best choice for serial communication. Use this “” if you want to change your password. so now your password has been changed. Thanks Martyn. I never would have figured this out without you — I could not get AT mode to save my life. In my case, the LED was just a red herring. It flashes at ~2.5 Hz upon power-up, and the button has no effect on that no matter when you press it or for how long. The LED only changes to two quick-flashed every couple of seconds upon successful Bluetooth connection. My LED rate has no relationship at all with AT mode. It never crossed my mind that it might only accept AT commands WHILE the button was being held down. A micro (or is it a mini?) binder clip holds that darned button down nicely for me. NIce Tutorial. I Follow this tutorial use HC-05 . I get version is 3.0-20170601. But AT+INQ is ERROR. its show as ERROR(1F). AT+INIT is ERROR (17). Can you help me for this problems ? I have a HC-05 module and I think I´m in AT mode the Led on the board is blinking slowly, like 2 secons ON next two seconds OFF. But when I send some commands I got no answer back pls help me, I need to know the adress from the bluetooth module. State -> Nothing cause im not using it. so my problem can be the voltage divider? I have tried bluetooth terminal app and I can sen text for the module but I cant receive text from Him also I still dont have answer by him. Pls help me. It´s working I think resistor dividor solve the problem. However this won’t work with the HC-05. Is it me or can you confirm that this approach won’t work with HC-05? The HC-06 is in command mode when first turned on. The HC-05 is not. The HC-05 has to be put in to command mode manually before (see above) you can change the name. Once you have the HC_05 in command mode you can use a sketch to issue commands. I Follow this tutorial use HC-05 . I get version is 3.0-20170601. But AT+INQ is ERROR. its show as ERROR(1F). AT+INIT is ERROR (17). Can you help me for this problems ? Pin 34 is high; other AT commands works fine. Also having the same issue, where V3 gets error 1F when running AT+INQ. Not sure what else to try at this point. 2. Keep the Rx, Tx pins on the HC-05 disconnected and plug in USB to computer. 3. Upload the code. Then connect the Rx, Tx pins back to the HC-05. 4. Disconnect the Vcc on the HC-05, hold the button, connect the Vcc on HC-05, then release button. 5. Open serial monitor, which is set at 9600 baud rate, both NL&CR chosen, and type ‘AT’ and press enter. I have tried holding the button and sending the command, but no difference. I’ve also tried changing the Serial.begin(9600) in your code with Serial.begin(57600) and changing the serial monitor baud rate to 57600, but still doesn’t work. I just want to make sure the baud rate is set correctly on the HC-05. Could you please offer a suggestion? Read through a few more comments, starting to think maybe I need the voltage divider. A confirmation would still be helpful though.